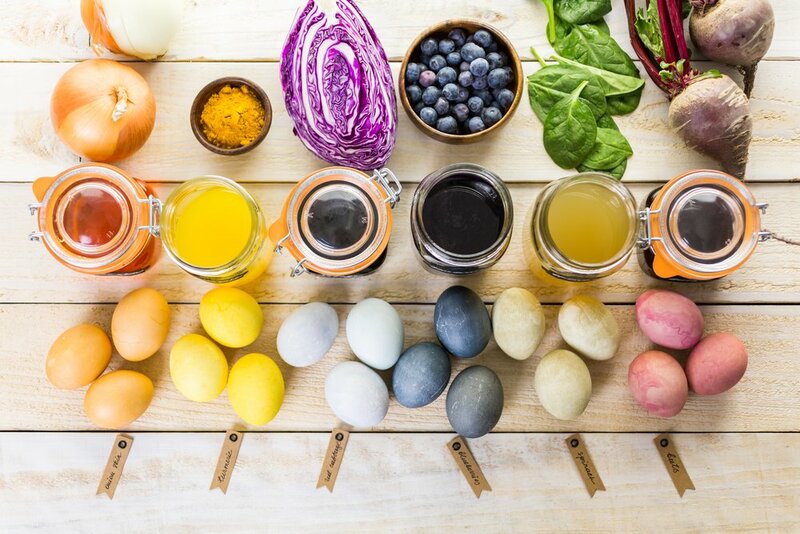 Naturally dyed eggs made at home using fruits, vegetables and spices. Put your choice of coloring ingredient (beets, blueberries or turmeric) into a small pot with 2 cups water and bring to a boil. Cover, reduce heat to medium-low and simmer for 10 minutes. Strain through a fine mesh sieve, discarding any solids, and then stir in vinegar. Set aside to let cool until warm or room temperature. To color eggs, submerge in dye, turning often for even coating, until desired color is reached. For more colors, dye eggs first in one color, then wipe dry and dye in a second color.